I have learned that real life communication is often like that game “telephone” we used to play as kids. When you play “telephone”, one person says a phrase in the ear of the person next to him, and then that person whispers the same phrase to the next person until the very last person says the phrase out loud. It’s funny since the phrase said out loud has little resemblance to the original. Every day I notice we all speak to each other yet the receiving end often gets a different meaning entirely, just like in the game. Just this morning, my son spent hours in class singing “Skip to my Lou” yet when he sang it back to me, said “Lou, Lou, skip to the moo”. Another example is listening to my friend from the UK who supposedly speaks perfect English, but with her accent and slang, I have no idea what she is saying most of the time. So it was no surprise when I called to order 1kg of onions from the grocery store today, and they gave me 1 kg of lemons instead. But rather than return them, I remembered the saying “When life gives you lemons, make lemonade.” So in the spirit of miscommunication, I changed the phrase from lemonade to lemon muffins, and luckily made a delicious misinterpretation. 1. Preheat oven to 400 farenheit. Grease muffin tins, set aside. 2. In a bowl, cream together butter, sugar and eggs. Add in flour, milk, lemon zest, salt and baking powder, mix well. 3. Spoon batter into the greased muffin tins, filling them 3/4 full. 4. Bake in preheated oven for 15-20 minutes. 5. Prepare topping. 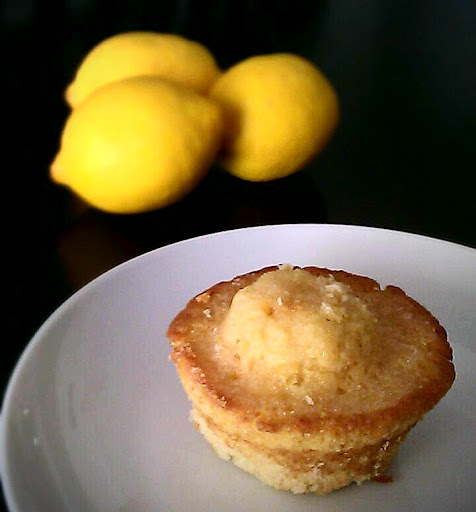 While muffins baking, combine the lemon juice from lemons and sugar in a bowl. Set aside. When muffins are baked, prick the tops with a fork, and drizzle topping over each muffin. Makes 12 muffins in standard muffin tin. This entry was posted in Desserts, Muffins/Cupcakes, Quick Dishes, Vegetarian and tagged easy, Lemon Muffins, muffins by thepantrydiva. Bookmark the permalink. how about some more. I only had one and rest by the monkeys.